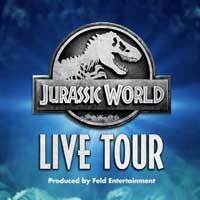 Tickets are now on sale for Jurassic World Live Tour, an exhilarating and unpredictable live, family entertainment experience that will bring the wonder and thrills of Jurassic World to generations of fans in the Chicago area and beyond. The highly anticipated show will host its world premiere at the Allstate Arena in Rosemont, Ill., Nov. 1-3, and continue touring the country with more than 65 stops. Jurassic World's unmistakable score adds to the larger-than-life, immersive journey that will captivate fans of all ages. Through a combination of projection and practical scenery, the arena will transform into the dense jungles of Isla Nublar, where real Gyrospheres roll through the valley and scientists work to unravel a corrupt plan and save an all-new dinosaur from a terrible fate. With pulse-pounding stunts and an original, authentic storyline, this show is guaranteed to make memories that will last another 65 million years. "Working with a world-class production team and Universal filmmakers, we have extended the Jurassic World canon with a new story that can only be told through this live, arena spectacular as we bring full-scale dinosaurs to generations of fans around the globe," said Juliette Feld Grossman, Chief Operating Officer of Feld Entertainment, the worldwide leader in live, touring family entertainment. "We have maximized the power of everything we do at Feld Entertainment, pushing the boundaries of technology and innovation to ensure audiences have an authentic, awe-inspiring experience. Fans will leave with a sense of wonder, as if they've boarded the boat to Isla Nublar and literally stepped into Jurassic World."